I like shining focus on products quite a bit but felt this was more necessary to do with a group effort this time around. I’ve rounded up five products that I have been loving this month. The only twist is that they had to be things I have not mentioned before. Luckily, I’ve been switching a lot up over the past month and could pick my five favourites within 10 seconds of looking at my counter. As if I wasn’t already head over heels in love with their last moisturizer release, I’m in love again. 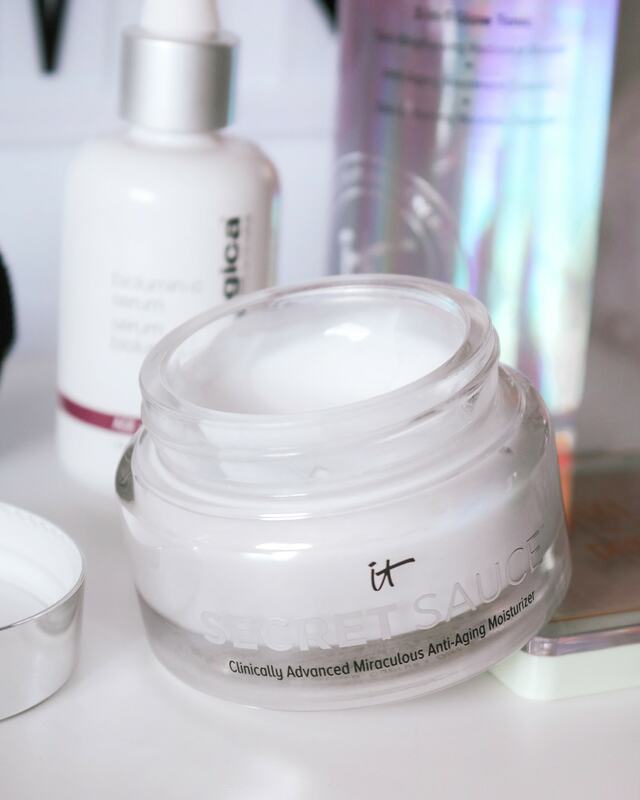 It Cosmetics recently came out with a few new skincare products that have absolutely wowed me. My daily essentials now include my new favourites: their Secret Sauce and Miracle Water 3-in-1 Tonic. What in the world is Secret Sauce? It’s full name is actually the Secret Sauce Clinically Advanced Miraculous Anti-Aging Moisturizer. That’s a mouthful! This new moisturizer contains their “Secret Sauce™ Fermented Complex”. This is a combination of ingredients that help to really maximize hydration and increase absorbency. This contains ingredients such as anti-ageing peptides, hydrolyzed collagen, hyaluronic acid, vitamin C, and liquorice root. All amazing key factors to make this the ultimate moisturizer! It is safe for all skin types and helps to reduce the signs of ageing, all while giving a youthful and radiant glow. Moving on to the product that does it all. 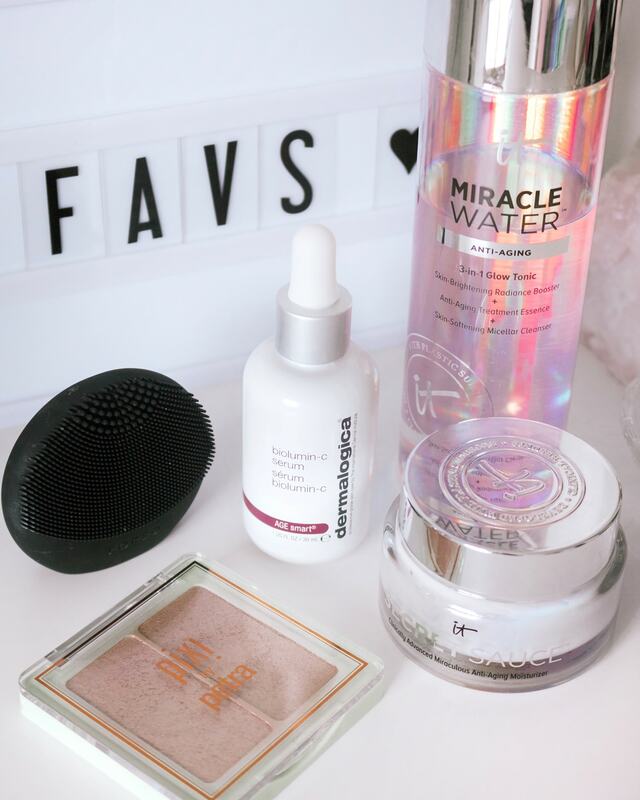 The Miracle Water is a skincare product that I don’t think I could do without after falling in love with. This liquid product is a radiance booster, a micellar cleanser, and an anti-age step all in one! 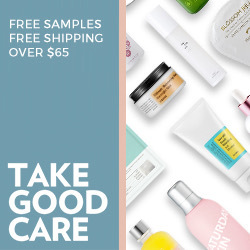 Made to go hand-in-hand with Secret Sauce, this product really tackles all of the steps of a skin care routine in one product. I put a bit of this product on to a cotton pad each morning and night and wipe it around my face. Getting all the benefits of each part of the product is so reassuring on my laziest of days. Adding in a cleansing tool to this post because I haven’t talked about this yet. I’ve been using the Foreo LUNA play. as part of my cleansing routine. I have used devices like this in the past but found some of them could be a bit harsh on my sensitive skin. I think this travel-friendly version of the original LUNA devices is a great idea for beginners. At least beginners with cleansing tools. This is a non-rechargeable device that goes through one battery cycle before going out of use. This averages about 100 uses for this device. You can use this smaller version as a trial to see if you would like one of the original versions. They can be quite costly as an investment. As your skin is extremely important, investments like these are worth it if it works well for you. My skin does not react as it is much softer on my skin than other cleansing tools, and it does an amazing job of deep cleaning my skin with my cleanser of choice. I would definitely consider buying a LUNA silicone cleansing brush in the future. I just need to enjoy each use of this smaller one first. When it comes to brightening, I’ve got a skin care and makeup item for you. 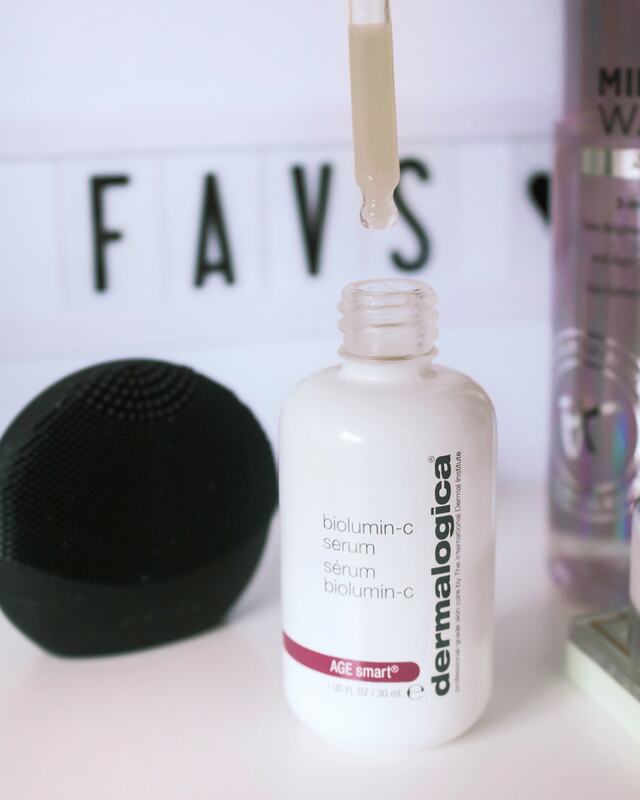 For your skin, I was to yell from the mountain tops how much I am loving the brand new Dermalogica Biolumin-c Serum. This brightening serum is a very great Vitamin C serum that helps brighten and firm your skin. As it is part of their anti-ageing range, it targets fine lines and wrinkles to help reduce the appearance of them. I always love Vitamin C serums, but this could be my ultimate favourite for how it smells and makes my skin feel after applying it. This is one of the first products I’ve ever used from the brand but really look forward to trying more in the future. Last, but definitely not least, is the one makeup item in this post. 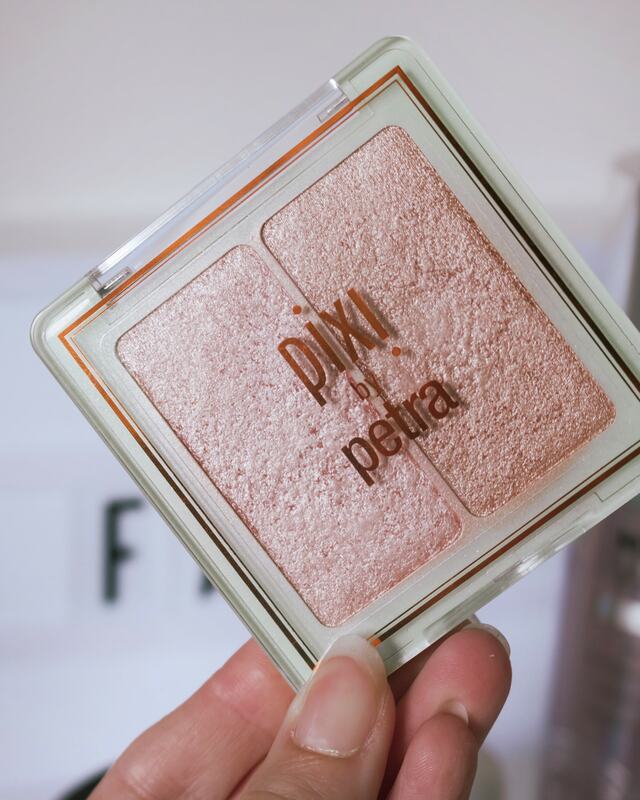 The spotlight is definitely all on the new Pixi Beauty Glow-y Gossamer Duo Highlights! I was drawn to them instantly when I got the PR box in the mail and have been using them ever since. I usually gravitate towards the duo named Delicate Dew, but also use the equally as stunning Subtle Sunrise duo a lot as well. These soft powders can be applied subtly with a very light hand. They can also be built up to more of a metallic, wet look if that’s what is desired. I usually swirl my brush between the two shades and apply a medium amount of highlight. It helps give that “lit-from-within”, but maybe a little more, look. Do you have any new favourite from this past month or summer in general? Let me know in the comments below!